Over a 60 year period, Martin devoted a great deal of his energy to writing about fringe science, skepticism and rationality, and much of what he wrote ended up in a dozen influential books, several of which collected columns, essays, and reviews he'd written for Skeptical Inquirer. From a publishing perspective, it started with "The Hermit Scientist" article that Martin wrote for The Antioch Review in Dec 1950, where he'd optimistically concluded, "The current flurry of discussion about Velikovsky and Hubbard will soon subside, and their books will begin to gather dust on library shelves." Martin's very first book was In the Name of Science (Putnam, 1952), subtitled, "An Entertaining Survey of the High Priests and Cultists of Science, Past and Present," and it was a comparitive flop at the time. It grew out of "The Hermit Scientist" article. Under a new title, Fads and Fallacies in the Name of Science (Dover, 1957), it took off bigtime. Today, it is considered to have been a key catalyst in the starting of a worldwide skepticism movement that flew in the face of irrationality and fringe science. In the mid 1970s, Martin joined forces with several like-minded people to set up a formal organization to confront what they saw as the rising tide of irrationality in society and the media, especially the uncritical acceptance of occult and paranormal claims. He was a founding member of The Committee for the Scientific Investigation of Claims of the Paranormal (CSICOP) in 1976. In 2006, CSICOP shortened its name to Committee for Skeptical Inquiry (CSI). 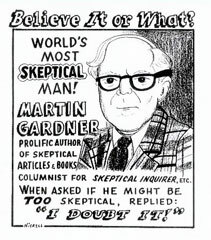 Its flagship publication, for which Martin wrote extensively, is Skeptical Inquirer. He had a regular column there from 1983 to 2002. Starting in 1981, he had a long and fruitful relationship with Prometheus Books, which is surveyed in the tribute essay Martin Gardner's Contributions to the World of Books by his friend and fellow CSICOP founder Paul Kurtz in Skeptical Inquirer. We'd be remiss if we didn't mention "Oprah Winfrey: Bright (but Gullible) Billionaire", one of Martin's very last publications, for Skeptical Inquirer (34.2, Mar/Apr 2010). He was, first and last, a debunker. Copyright © 2014 Gathering 4 Gardner, Inc. (G4G) All Rights Reserved.